North Atlantic Books, 9781583946756, 360pp. MARCEY SHAPIRO, MD, is a family physician with extensive training and experience in many areas of natural medicine including Western and Chinese herbal medicine, acupuncture, flower essences, homeopathy, breathing techniques, nutritional therapies, Scenar®, and hands-on modalities such as Ortho-Bionomy® and Biodynamic Osteopathy. She works with patients to address the many facets of illness/imbalance--biophysical, psychological, and spiritual--and creates realistic treatment plans that incorporate a variety of modalities. 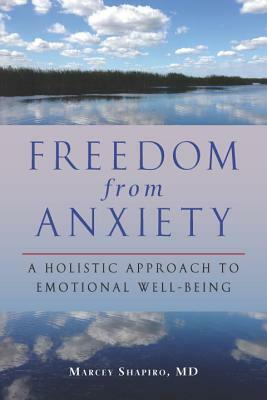 “Freedom from Anxiety is an amazing journey through the ‘minefield’ of anxiety. An extensive overview with both general and specific suggestions, it addresses this widespread syndrome from all levels: physical, emotional and spiritual. A holistic approach in the fullest sense of the tradition, this book provides a calming pathway with possible strategies and practical applications for the majority of sufferers. A must-read for every physician who is dealing with patients suffering from anxiety. —Jill Lebeau, MFT, spiritual psychotherapist and coauthor of Feng Shui Your Mind: Four Easy Steps to Rapidly Transform Your Life!